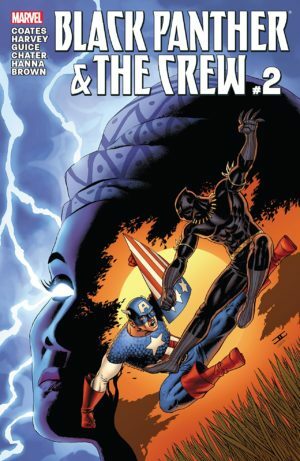 REVIEW: Black Panther and the Crew #2 – "It's Time to Go Home"
Misty continues to unravel the mystery surrounding Ezra Keith’s murder while learning more about his secret past –and Ororo’s – in Black Panther and the Crew #2. Plot: After being attacked the last issue, Storm and Misty continue their investigation into the death of Ezra. Meanwhile, in flashbacks, we learn more about Ezra’s origin as a hero and Storm’s connection with Harlem. 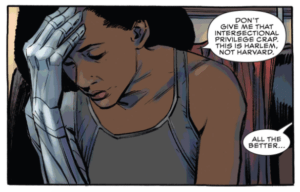 Story: There is no doubt that Ta-Nehisi Coates and Yona Harvey are strong writers, however, readers expecting heightened action after the lengthy exposition of the last issue will be in for a disappointment. Instead of moving forward with the mystery, we move back. Way back. 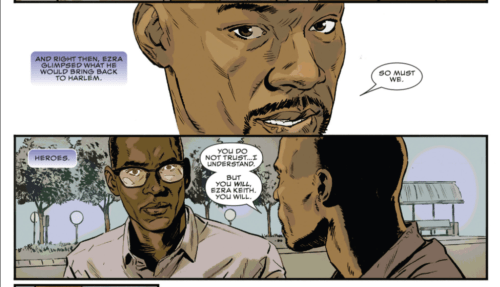 While Black Panther and The Crew #1 showed Ezra as a hero in Harlem, #2 hints at how he came to be that way. 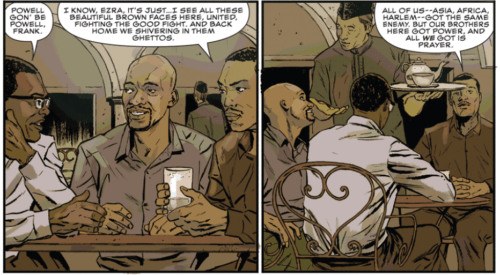 The writers do a good job of still leaving enough mystery around Ezra, but they start chipping away at the mystery of how heroes came to Harlem and laying the groundwork for Black Panther’s involvement by referencing Wakanda. While the last issue focused on Misty’s perspective, we see more character development from Storm (aka Ororo aka Blue) this issue, and some of her speeches on her identity – both as a mutant and a black woman- really highlight the skill of this writing team to examine deeper issues of humanity. Art: The art for this book continues to be less compelling for me than the story told. However, Guice’s art does lend to the grounded, realistic tone of the book. By making the focus of the panel normally Harlem itself instead of the characters, you feel like you’re in the city with them. Storm’s emotional journey is not always reflected in the pages however if simply for the fact she’s always in sunglasses and it’s harder to capture emotion without the eyes. The muted color palette, especially for the scenes set in Africa, add a realism to the book. Dan Brown’s coloring also adds spectacular dimension and shadow to the panels creating an air of mystery, especially towards the end when Storm visits Marla. Seeing Storm use her powers allows the artists to spice up the panels with some action, which I hope means some even more explosive sequences once The Crew is fully assembled. Verdict: While I expected more action after a slow build up in #1, Coates and Harvey make good use of the issue by digging into Storm’s emotional connection to Harlem. A lot of readers may only know Storm from her X-Men past, so this exposition is necessary to ground the story. However, I hope we don’t get this kind of exposition for each member of the Crew or we’ll never get to any action. 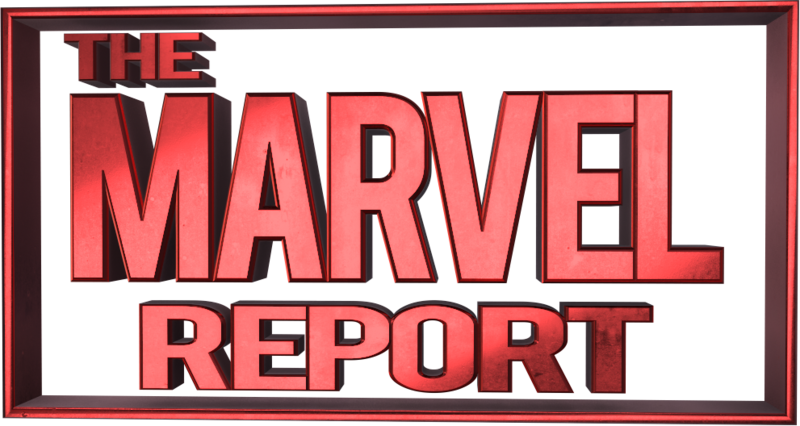 Full disclosure, I’m finishing this review after finding out Marvel has decided to cancel Black Panther and The Crew and only publish through the first six-issue arc. That said, Coates and Harvey are telling an interesting story with a mystery they promise to resolve by issue #6, so I don’t think the pending cancellation should discourage readers from picking this up.